Thank you all who sent me words of advice, support and encouragement in response to my To Be Determined post. I have decided to continue doing the blog, but not on a daily basis. I plan to post twice a week – probably on Tuesdays and Thursdays and if my muse moves me, also on Sundays with my weekly Someday Funnies post. Also, thank you to all who contributed to my Coffee Break! Your contributions will help defray some of the blog's costs. And so it keeps on going! Gabriel Sanches femulates in the Brazilian television's The Big Catch. Thank you Stana I look forward to you & your Blog ! Stana.... please know that many of us depend on you for great trans content! Don't go away! deborah s.
As one of the gals who helped out with the coffee break, this is great news! I just wish you'd told us about your falling out with Adsense; I would have given a lot earlier if I'd known about it. 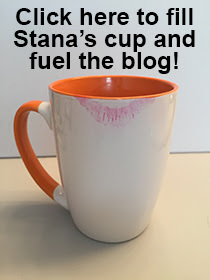 I just sent a small donation to you via the “... fill Stana’s cup ...” link. It shows my male name, which you may recognize by some past posts or emails to you that I accidentally sent from my guy email account. My “twin brother’s” initials are R. K.
Thank you, Sheila! It is much appreciated!